Somebody wore himself out in the exersaucer. Such a sweet baby! 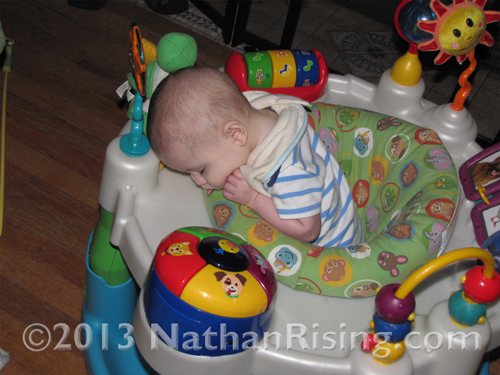 He reminds me so much of his big brother Nathan, who also played really hard in the very same exersaucer. I seriously can’t get enough of my kids- my heart is so full of love that sometimes I think it will just explode! Nathan is slowly moving away from taking naps. As of now, he still naps when he’s really tired, but it’s getting more difficult to get him to fall asleep. I’ve been co-sleeping with him (during nap times only) since he was 11 months old. At first, I welcomed the rest and the naps. Here lately, probably because I have more energy from losing weight and being more active, I don’t nap with Nathan all that much. I’ll usually lay down with him until he falls asleep, and then I get up. Today I wanted to get some rest. Nathan’s agenda for today, on the other hand, did not include sleeping. I laid with him for over an hour as he played with his hands and the blanket. When I finally told him to go to sleep or I would put him in his own bed, he pouted and pulled the covers up over his face. I laid there and watched him for over five minutes. He laid perfectly still, and the only reason I knew he was not asleep was because his breathing wasn’t deep and regular. Pretending to be asleep for over five minutes is an ETERNITY in toddler time. I had to give him credit. He tried damn hard to make me think he was asleep. He didn’t twitch, didn’t talk, and he didn’t move at all. He was perfectly still. I know adults that aren’t capable of pulling that off. So finally, as I watched him, he slowly reached his hand up to the blanket that he had pulled over his face. His fingers carefully grasped the edge of the blanket and ever so slowly, he pulled the blanket down, exposing his wide-awake eyes. “HI MOMMY!” he exclaimed when he saw me watching him. There was not one ounce of sleepiness in his voice. “No nap, Mommy. I sorry. Mommy TIRED. No nap. Get up?” he said as he sat up in one swift motion. “No not yet,” I said as I pondered how it could be humanly possible for someone to sit up with such speed. “Seriously, I’m tired.” Then he plopped back down beside me and nestled his arm under my chin. I couldn’t help but kiss it. “Get up? Ready get up?” he implored. Fine. How could I say no? The kid laid as still as a statue for OVER FIVE MINUTES. “Okay, Mommy!” he said as he dove into his toys. My baby boy is growing up and naps are starting to become more scarce. I don’t think he’s going to give them up entirely just yet because there have been plenty of times where he’s been so tired that he could hardly hold his eyes open. But it’s definitely heading in that direction. Hopefully, he still has a year or two of napping, even if it is sporadic. I can get so much done when he’s sleeping… not to mention, some time to myself is always nice. Well, Nathan and I are both sick today. Nathan started getting sick last Thursday, and of course, he’s passed it on to me. I noticed my throat trying to get sore yesterday, and right now, it’s really sore and driving me crazy. Especially at night, when it gets worse. Nathan’s not been sleeping well- probably because of his sore throat- so that makes things a little harder because not only is he sick, but he’s really tired and whiny! In other news, he said the cutest thing to me yesterday. I had laid him down in my bed for his nap, and he was wiggling around, fidgeting, and trying to sit up. I realized I had to get up to get something, so I laid him back down, and I told him to lay right there and don’t get up. When I came back, he was beaming from ear-to-ear. “I mind you! I mind you!” he exclaimed happily. I leaned over and kissed his sweet forehead. And I couldn’t help but grin at the notion that my child gets excited when he minds me.